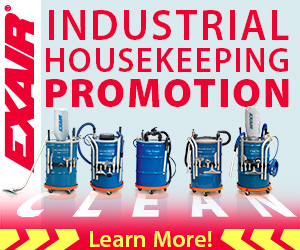 It is important to know the cost of compressed air at your facility. Most people think that compressed air is free, but it is most certainly not. Because of the expense, compressed air is considered to be a fourth utility in manufacturing plants. In this blog, I will show you how to calculate the cost to make compressed air. Then you can use this information to determine the need for Intelligent Compressed Air® products. motor efficiency – average for an electric motor is 95%. 100hp * 0.746 KW/hp * 1,000hr * $0.08/KWh / 0.95 = $6,282 per year. In both equations, you can substitute your information to see what you actually pay to make compressed air each year at your facility. The type of air compressor can help in the amount of compressed air that can be produced by the electric motor. Generally, the production rate can be expressed in different ways, but I like to use cubic feet per minute per horsepower, or CFM/hp. The positive displacement types have different values depending on how efficient the design. For a single-acting piston type air compressor, the amount of air is between 3.1 to 3.3 CFM/hp. So, if you have a 10 hp single-acting piston, you can produce between 31 to 33 CFM of compressed air. For a 10 hp double-acting piston type, it can produce roughly 4.7 to 5.0 CFM/hp. As you can see, the double-acting air compressor can produce more compressed air at the same horsepower. The rotary screws are roughly 3.4 to 4.1 CFM/hp. While the dynamic type of air compressor is roughly 3.7 – 4.7 CFM/hr. If you know the type of air compressor that you have, you can calculate the amount of compressed air that you can produce per horsepower. As an average, EXAIR uses 4 CFM/hp of air compressor when speaking with customers who would like to know the general output of their compressor. So, if we look at the average of 4 CFM/hp and an average electrical rate of $0.08/KWh, we can use Equation 3 to determine the average cost to make 1000 cubic feet of air. C = 1000 * $0.08/KWh * 0.746 / (4 CFM/hp * 60) = $0.25/1000ft3. Once you have established a cost for compressed air, then you can determine which areas to start saving money. One of the worst culprits for inefficient air use is open pipe blow-offs. This would include cheap air guns, drilled holes in pipes, and tubes. These are very inefficient for compressed air and can cost you a lot of money. I will share a comparison to a 1/8” NPT pipe to an EXAIR Mini Super Air Nozzle. (Reference below). As you can see, by just adding the EXAIR nozzle to the end of the pipe, the company was able to save $1,872 per year. That is some real savings. Making compressed air is expensive, so why would you not use it as efficiently as you can. With the equations above, you can calculate how much you are paying. You can use this information to make informed decisions and to find the “low hanging fruit” for cost savings. As in the example above, targeting the blow-off systems in a facility is a fast and easy way to save money. If you need any help to try and find a way to be more efficient with your compressed air system, please contact an Application Engineer at EXAIR. We will be happy to assist you. The use of compressed air can be found in almost any industry and is often referred to as a “fourth utility” next to water, gas and electric. The generation of compressed air accounts for approximately 1/3 of all energy costs in an industrial facility, in many cases, it’s the largest energy user in an industrial plant. With an average cost of $ 0.25 per every 1,000 SCF used, compressed air can be expensive to produce so it is very important to use this utility as efficiently as possible. Utility companies recognize the benefit of using engineered products to reduce compressed air usage, like the ones manufactured by EXAIR, and offers rebate incentives for making a switch. Our local utility provider here in Cincinnati, Duke Energy, offers a $ 20 incentive for each replacement engineered nozzle. In their specification, the nozzle must meet a certain volumetric flow rate (SCFM) at 80 PSIG operating pressure for a given pipe size. For example, when looking at a 1/4″ nozzle, the flow rate must be less than or equal to 17 SCFM when operated at 80 PSIG. Our most popular nozzles for “general” blowoff applications would be our Model # 1100 (1/4″ FNPT) or our Model # 1101 (1/4″ MNPT) Super Air Nozzles. These nozzles require 14 SCFM @ 80 PSIG so this would be the ideal solution to reduce the air demand and take advantage of the rebate. Here at EXAIR, much of our focus is to improve the overall efficiency of industrial compressed air operating processes and point of use compressed air operated products. If you’d like to contact one of our application engineers, we can help recommend the proper engineered solution to not only save on your compressed air usage but also assist with possible energy rebates available in your area. 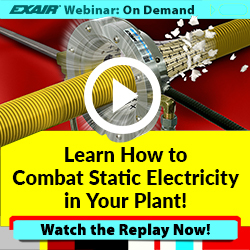 Leaks in a compressed air system can waste thousands of dollars of electricity per year. In fact, in many plants, the leakage can account for up to 30% of the total operational cost of the compressor. Some of the most common areas where you might find a leak would be at connection joints like valves, unions, couplings, fittings, etc. This not only wastes energy but it can also cause the compressed air system to lose pressure which reduces the end use product’s performance, like an air operated actuator being unable to close a valve, for instance. The percentage of compressor capacity that is lost should be under 10% for a system that is properly maintained. Another method to calculate the amount of leakage in a system is by using a downstream pressure gauge from a receiver tank. You would need to know the total volume in the system at this point though to accurately estimate the leakage. As the compressor starts to cycle on, you want to allow the system to reach the nominal operating pressure for the process and record the length of time it takes for the pressure to drop to a lower level. As stated above, any leakage more than 10% shows that improvements could be made in the system. Now that we’ve covered how to estimate the amount of leakage there might be in a system, we can now look at the cost of a leak. For this example, we will consider a leak point to be the equivalent to a 1/16″ diameter hole. A 1/16″ diameter hole is going to flow close to 3.8 SCFM @ 80 PSIG supply pressure. An industrial sized air compressor uses about 1 horsepower of energy to make roughly 4 SCFM of compressed air. Many plants know their actual energy costs but if not, a reasonable average to use is $0.25/1,000 SCF generated. As you can see, that’s a lot of money and energy being lost to just one small leak. More than likely, this wouldn’t be the only leak in the system so it wouldn’t take long for the cost to quickly add up for several leaks of this size. If you’d like to discuss how EXAIR products can help identify and locate costly leaks in your compressed air system, please contact one of our application engineers at 800-903-9247. The National Resource Defense Council (NRDC) issued a report this October that America had used the same amount of energy (measured in BTU’s) as it had used in 1999. We have reduced our energy usage per person, while still growing the economy, a feat that I would not have thought possible. You can read the full report here: NRDC Energy Report. So often environmental news is dire and gloomy, but this news shows the power of energy efficiency. As noted in the report, politicians and media members focus on where we are going to find new energy resources. As opposed to opening up new energy reserves, we have reaped larger rewards from spending time and money conserving the energy over the last thirty-five years. 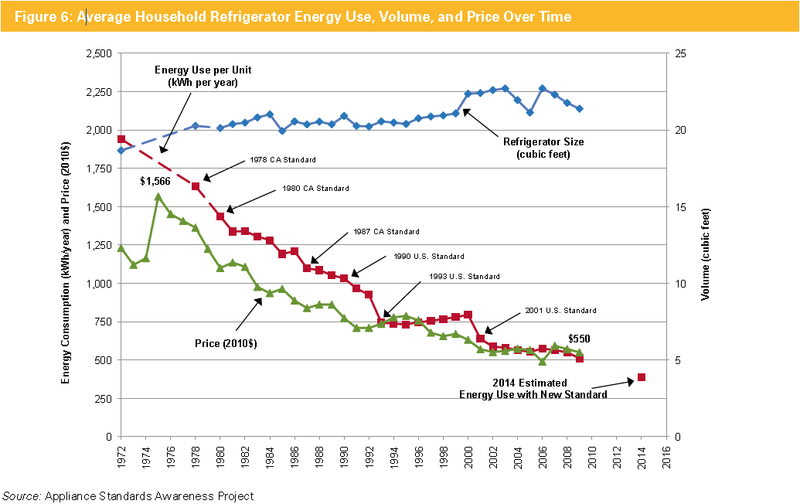 The energy report uses the household refrigerator as an example of an appliance, whose increasing energy efficiency greatly decreased our electrical load per person. Refrigerators use 1/4 as much energy as the same size refrigerator used in 1975. This decrease in energy usage is a huge gain for the user who replaces their refrigerator and for the power grid that doesn’t need to build a new power plant to keep up with the increased load. 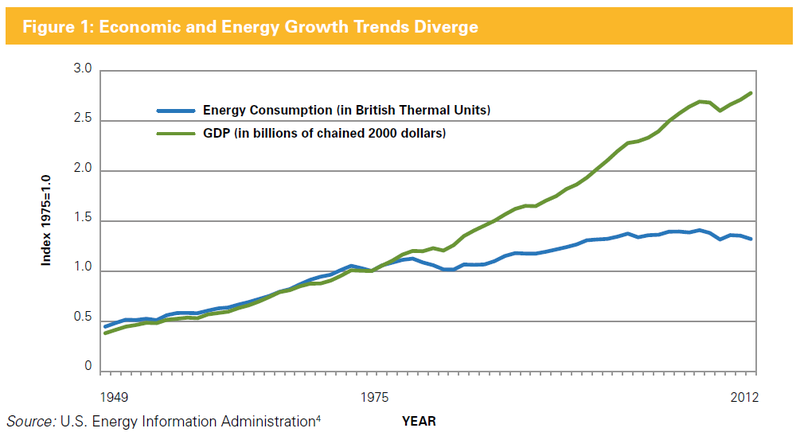 As an EXAIR employee, I can not help but notice that EXAIR opened in 1982, which is one of the first years in the graph above were economic growth was not directly tied to energy usage. At EXAIR, we realize the impact of conserving compressed air can have on your compressed air system. By replacing home-made blow offs like open tubes or holes drilled in pipe with Super Air Nozzle or Super Air Knife engineered solutions, you conserve compressed air and save money. This also reduces wear on the your compressor and can extend its life. A model 1100 Super air nozzle uses 14 SCFM when fed with 80 PSIG, which is a 58% reduction from 1/4″ open copper tube, which uses 33 SCFM when fed with 80 PSIG. Go to our Air Savings Calculator to see how much compressed air and money you can save by replacing those home made blow offs.